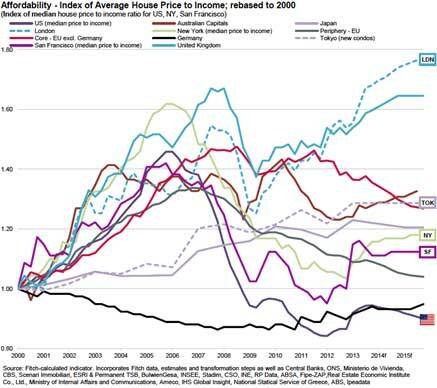 The GFC caused major chaos for housing markets around the world and spurred downward spirals in confidence. The latest data from Fitch Ratings on price movements, affordability, gross lending and arrears of the global residential property market gives a decent indication of a pick up in key countries. 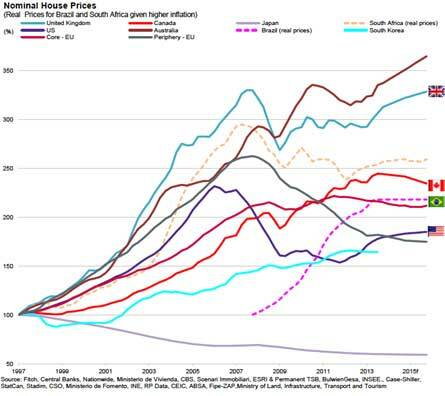 Australian house prices are well ahead of the rest of the world, having overtaken the UK in the immediate aftermath of the crisis. Fitch expects that Australian prices will continue to increase at an accelerated rate into 2015. The UK will experience softer growth in comparison. While US prices have steadily increased since a trough of 2011 this still remains 25% lower than their 2006 peak. House prices increased by 11.8% in the 19 months to December 2013. This followed a decrease of 7.4% in the previous 19 months. Fitch expects a modest 4% improvement in house prices in 2014. 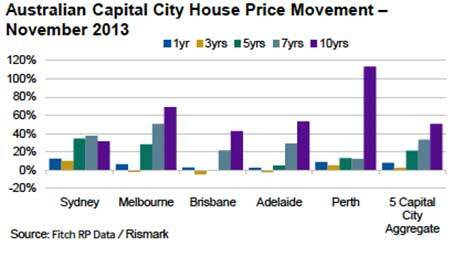 As the graph below indicates Perth has seen the greatest increases over a 10-year period, while Sydney has been leading the charge in the last year. 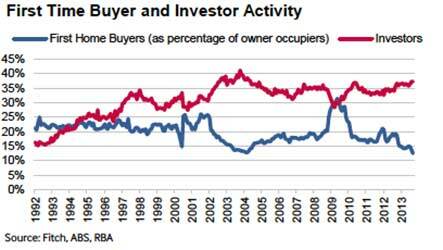 Investor activity burgeoned in 2013, while first homebuyers activity was at all time lows. No need to be a genius to figure out why. Compared to the rest of the world, Fitch shows that Australia is the second most expensive country to live based on average house price to income. The United Kingdom takes the unenviable title as least affordable. Similar to the Australia/Sydney residential property market story, London outstrips the national average by 30-40%. In comparison, the United States has become one of the most affordable countries since the crisis and is forecast to become the most affordable country by 2015. This is despite further expected increases in interest rates as the broader economy improves. 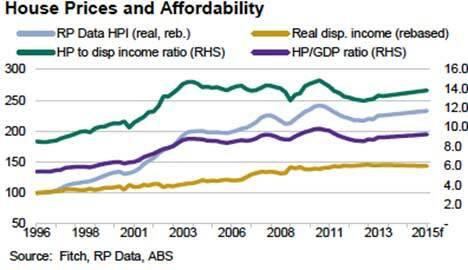 The graph below clearly shows decreases in affordability since mid 2012 and flat lining disposable income since 2011. Despite this, Fitch expects overall affordability will remain stable in 2014 due to the continued low interest rate environment. Ireland has suffered a high level of delinquency since the onset of the financial crisis, far outstripping even the US and Greece. 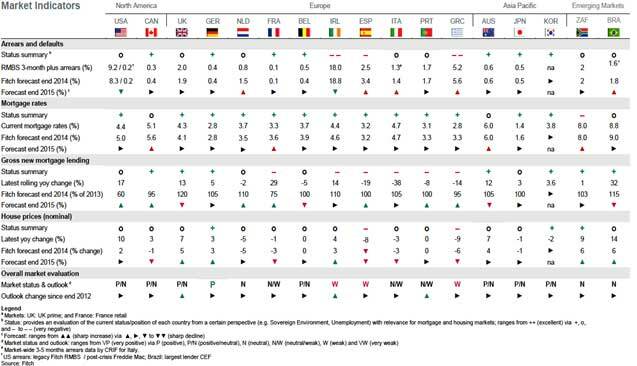 While delinquency levels in Greece are expected to increase in 2014-15, the US and Ireland are expected to decrease due to a pick up in the housing market in the US which is encouraging struggling owners to sell, and new arrangements in Ireland which urge banks to find long term, sustainable solutions for distressed mortgages. The UK sits comfortably within the low ranges of delinquency, improving from 2.5% in 2009 to 1.8% at the year-end of 2013. 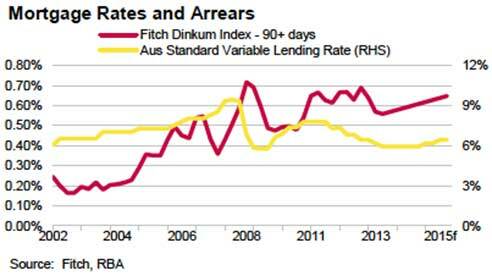 Despite insignificant arrears levels compared to the rest of the world, slow income growth, rising house prices and the prospect of increasing unemployment is leading Fitch to expect an increase in arrears for Australia in 2014. The graph below indicates that the increases in arrears will be significantly affected by a slight increase in the lending rate. Lending volumes in the UK are expected to continue improving on the back of the Help-to-Buy initiative and housing market recovery. 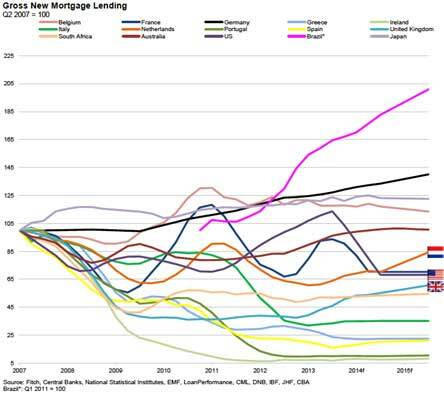 In contrast, the US is expected to experience decreasing levels of new mortgage lending as the Fed continues to taper the quantative easing program and interest rates slowly increase. Brazil is the clear outlier here. Fitch believes that the accelerated growth in lending in Brazil is unsustainable and will ease off during 2014 due to a sluggish economy. 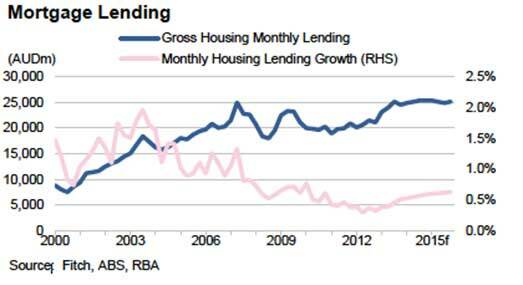 Despite affordability issues and the prospect of increasing arrears, Fitch expects that lending in Australia will cautiously increase in the housing market in 2014 and plateau into 2015. 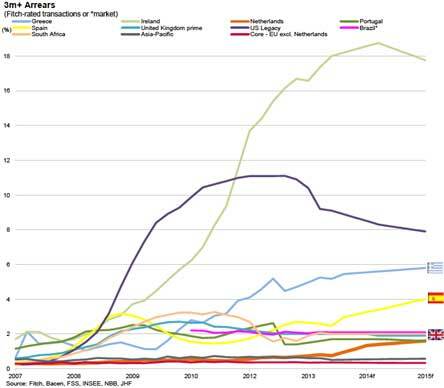 The housing market outlook around the world has either improved or stayed largely the same compared to the previous year. This is largely due to improvements in global economic conditions as well as the favorable economic policy by central banks and governments. Historically low interest rates and eager investors have powered the Australian residential property market and look set to continue to do so into 2014. Whilst this experience is yet to translate into other sectors of the Australian economy we can expect the continuation of low interest rates for some time, leaving affordability concerns abated for now and perhaps the sleeper issue for an inevitable upswing in the interest rate cycle.